As discussed in Part 1 there are some unfortunately misnamed characters, and as discussed in Part 2 Unicode character names once assigned can never be changed, and so misnamed characters are stuck with their names whether they like it or not. Whilst the characters themselves may or may not mind what they are called, characters with wrong names cause untold anguish to some people. Until now there has not been very much that can be done about the problem, and if anyone complains about a particular character name all that Unicode can advise them is that character names are intended as unique mnemonic identifers and should not be relied on for identification of a character's function or meaning — which is unfortunate as most character names can be relied on for this purpose. There are two important points to be made about these formal aliases. Firstly, formal aliases will only be given to the most perniciously misnamed characters, and not to every character which has a sub-optimal name, or for which there is academic dispute about the transliteration or naming convention to use. Secondly, formal aliases are completely different to the aliases already provided in the Unicode code charts. The code chart aliases are alternative names by which a character may be known, and are provided for information only. On the other hand, the fomal aliases conform to the Character-naming guidelines (and must be unique within the scope of both character names and formal aliases), and so look just like real character names, and are intended to be used in place of the real character names in applications' user interfaces. Here is some of the history behind these characters. The character names reflect the ghyph shape of this letter (Ƣ), and do represent its phonetic value. The letter was devised to represent the sound /gh/, and was used in the Kirghiz Latin alphabet between 1928 and 1940. I've no idea how it came to be that a letter that is used to represent a Dravidian /l/ sound should be named KANNADA LETTER FA. The alias is spelled with three L's in accordance with the unofficial convention of distinguishing flavours of the same letter by reduplicating the ASCII letter used to represent it. KANNADA LETTER LA [U+0CB2] and KANNADA LETTER LLA [U+0CB3] are already taken, so the alias for U+0CDE is KANNADA LETTER LLLA; and if ever a new Kannada letter representing a different flavour of /l/ were to be invented, it would no doubt be named KANNADA LETTER LLLLA ! The Lao script was part of the original Unicode 1.0 repertoire encoded in 1991, but these two pairs of swapped character names did not come to light until October last year, when a user of the French version of BabelMap queried the names of LAO LETTER FO TAM and LAO LETTER FO SUNG with me. I raised the matter on the Unicode mailing list, and got confirmation from a number of experts on the Lao script that there were indeed some mistakes with Lao character names. The result was that, although I know very little about Lao, I ended up writing a document summarizing the issues with Lao character names, and recommending possible solutions. One of my recommendations was that the misnamed letters be assigned the formal aliases that are now to be assigned. Most of the consonants in the Lao block are named from the syllabic sound of the letter, plus the word SUNG "high" or TAM "low" to indicate a high tone class or low tone class if two letters share the same syllabic sound. U+0E9D and U+0E9F both share the same syllabic sound, FO, but the former character is a high tone class letter and should have been named LAO LETTER FO SUNG, whilst the latter character is a low tone class letter and should have been named LAO LETTER FO TAM. Unfortunately, the names of this pair of characters were assigned the wrong way round. As formal aliases must be unique and cannot duplicate an existing character name, it is not possible to assign what should have been their correct names as the formal aliases, and so the formal aliases for these two characters needed to based on a different naming system. Luckily, the Lao people do not normally name their letters using SUNG and TAM, but use mnemonic names similar in form to English "A is for Apple", "B is for Ball", etc., and so the formal aliases could be based on the characters' mnemonic names. There are no official Lao mnemonic names, and the mnemonics may vary from one source to another, but for these two characters the most common mnemonic names are FO FON "fo as in the word fon [rain]" and FO FAY "fo as in the word fay [fire]". Thus the formal aliases for U+0E9D and U+0E9F are LAO LETTER FO FON and LAO LETTER FO FAY respectively. The most common mnemonic names for the other consonants are being added to the code charts as informal aliases. The names for U+0EA3 and U+0EA5 are different from all the other Lao consonants, as they are the only two letters with character names that are based on mnemonic names, LO LING "lo as in the word ling [monkey]" and LO LOOT "lo as in the word loot [motor car]". However, the mnemonic names are the wrong way round, with U+0EA3 named LAO LETTER LO LING when it should have been named LAO LETTER LO LOOT, and U+0EA5 named LAO LETTER LO LOOT when it should have been named LAO LETTER LO LING. The reason for the different naming system for these two letters was presumably due to the fact that they are both low tone class letters, and they could not both be named LAO LETTER LO TAM. Actually U+0EA3, which has been deprecated by the Lao government since 1975, is used to represent [r] in foreign words, and so the two letters could have been differentiated by simply naming them LAO LETTER RO and LAO LETTER LO — which are the names used for the formal aliases. This character is full of woe. To start with its proper name was misappropriated by U+0F0A. U+0F0A, which was encoded in Unicode 2.0, is a Bhutanese mark used in formal documents to indicate an inferior addressing a superior, and should have been named something like TIBETAN MARK ZHU YIG GI MGO RGYAN, corresponding to the Tibetan zhu yig gi mgo rgyan ཞུ་ཡིག་གི་མགོ་རྒྱན "starting flourish for making a petition"; but somehow it got assigned the name TIBETAN MARK BKA- SHOG YIG MGO, corresponding to the Tibetan bka' shog yig mgo བཀའ་ཤོག་ཡིག་མགོ "starting flourish for giving a command". So when the character that actually indicates a superior addressing an inferior was encoded in Unicode 4.1 at U+0FD0 it had to be given a slightly different but synonymous name, which should have been TIBETAN MARK BKA- SHOG GI MGO RGYAN, corresponding to the Tibetan bka' shog gi mgo rgyan བཀའ་ཤོག་གི་མགོ་རྒྱན. Unfortunately, BKA- became miswritten as BSKA- (a syllable that does not naturally occur in Tibetan) in the proposal (N2694). Mistakes like this can be hard to spot if you don't know Tibetan. Luckily I do know Tibetan, and pointed out the mistake on the Unicode mailing list when the proposal was first announced; but unfortunately I didn't check to see that the mistake had been corrected as the character progressed towards standardization, so I feel somewhat responsible for this one. When the Liangshan Yi script was originally proposed for encoding in 1995 (see N1187) there was some confusion over a character ꀕ that appeared in some Yi sources but not in others. This was given the name YI SYLLABLE WU and positioned between the syllables with vowel initials and the syllables with consonant initials. vat ꃪ "OK"; and vat vat ꃪꀕ (for ꃪꃪ) "OK ?" bbo ꁧ "go"; and bbox bbo ꁦꀕ (for ꁦꁧ) "shall we go ?" zzyr muo ꋬꂻ "fine and well"; and zzyr muox muo ꋬꂺꀕ (for ꋬꂺꂻ) "Are you fine and well ?" In the Yi phonetic alphabet, syllable iteration is represented by the letter "w", so that ꃪꀕ is represented as vatw (for vat vat), ꁦꀕ is represented as bboxw (for bbox bbo), and ꋬꂺꀕ is represented as zzyr muoxw (for zzyr muox muo). This is presumably where the mistaken notion that the character ꀕ represents the sound /wu/ came from. In fact the reason why the iteration mark ꀕ is represented by the letter "w" is simply because it looks like a letter "w" with two vertical strokes beneath it (i.e. 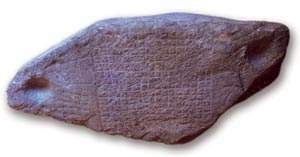 the "w" approximates the glyph shape of the character, and not its phonetic value). More details on this character and other Yi issues can be found in a document that I wrote for the UTC in 2004. A really embarrassing mistake, that was first pointed out by Alan Wood shortly after the character was released into the wild as part of the Unicode 4.1 repertoire in March 2005. At that time the corresponding Amendment 1 of ISO/IEC 10646:2003 was only at the FDAM stage, and it wouldn't be published until November of that year, but it was too late to change it as the ISO and Unicode character names cannot differ. Twenty Byzantine musical symbols with the word FTHORA in their names were introduced in Unicode 3.1, but somewhere along the line one of them got mistyped as FHTORA. An easy mistake to make, but a difficult mistake to spot, especially if you don't read Greek — which I don't (and for anyone else who doesn't, according to an internet dictionary the word φθορά means "abrasion, decay, deterioration, vitiation, waste, wear, weathering"). The one thing about Unicode that really seems to bug people more than anything else is that the character names are not always perfect, are sometimes misleading, and in a few cases are just plain wrong. Misuse of technical terms, such as ligature ("a character or type formed by two or more letters joined together"), digraph ("a group of two letters representing one sound") and ideograph ("a character symbolizing the idea of a thing without expressing the sequence of sounds in its name"). Misinterpretation of a character's glyph shape (e.g. U+2118 ℘ SCRIPT CAPITAL P, which is actually a calligraphic lowercase p). Misunderstanding of a character's meaning or function (e.g. U+A015 ꀕ YI SYLLABLE WU, which is not a syllable pronounced "wu" but a syllable iteration mark). Confusion of one character with another (for example the names of U+0EA3 LAO LETTER LO LING and U+0EA5 LAO LETTER LO LOOT are the wrong way round). Simple typographic errors, such as U+FE18 PRESENTATION FORM FOR VERTICAL RIGHT WHITE LENTICULAR BRAKCET. In addition to these sort of problems, there are also many character names that are technically "correct", but which some people still object to, for example because the name represents the pronunciation of the character in one language but is pronounced differently in their language, or because the Unicode name is based on one system of transliteration, but they prefer a different system of transliteration (character names are constrained to the letters "A" through "Z", the digits "0" through "9", space and hyphen, so often there is no choice but to resort to awkward names such as DEVANAGARI LETTER LLLA). In cases such as these the alternative pronunciation or transliteration may be annotated in the Unicode code charts. When names are not correct, what is said will not sound reasonable; when what is said does not sound reasonable, affairs will not culminate in success; when affairs do not culminate in success, rites and music will not flourish; when rites and music do not flourish, punishments will not fit the crime; when punishments do not fit the crime, the common people will not know where to put hand and foot. But, hey, I'm not a Confucianist, so I don't mind too much about wrong or misleading character names (except for U+A856 of course, which will irk me to the grave), and I have no problems referring to 漢字 as ideographs -- to me it's just a convenient label. Anyway here is my list of characters which either deliberately or accidentally have sub-optimal names. This is by no means an exhaustive list, and other people will no doubt have their own suggestions to add. LATIN SMALL LIGATURE IJ These are not ligatures as the "i" and "j" are not joined together. LATIN SMALL LETTER OI These characters represent the letter "gha" used in the Kirghiz Latin alphabet between 1928 and 1940, and have nothing to do with either "o" or "i". 01BE ƾ LATIN LETTER INVERTED GLOTTAL STOP WITH STROKE Whilst this character superficially looks like an inverted glottal stop, it is in fact derived from a ligature of the letters "t" and "s", which explains its use as an archaic phonetic representation of [ts] as an affricate (e.g. for the sound of the "z" in German Zimmer "room"). LATIN SMALL LETTER QP DIGRAPH These characters are ligatures of "db" and "qp" respectively, and not digraphs. COMBINING CARON BELOW These and 42 other precomposed characters such as U+010D LATIN SMALL LETTER C WITH CARON č use the word "caron" to signify what is normally called a háček ("little hook" in Czech). Indeed, in Unicode 1.0 the names of these letters all used the term HACEK (e.g. U+02C7 MODIFIER LETTER HACEK), but all instances of "hacek" were changed to "caron" when Unicode merged with ISO/IEC 10646. 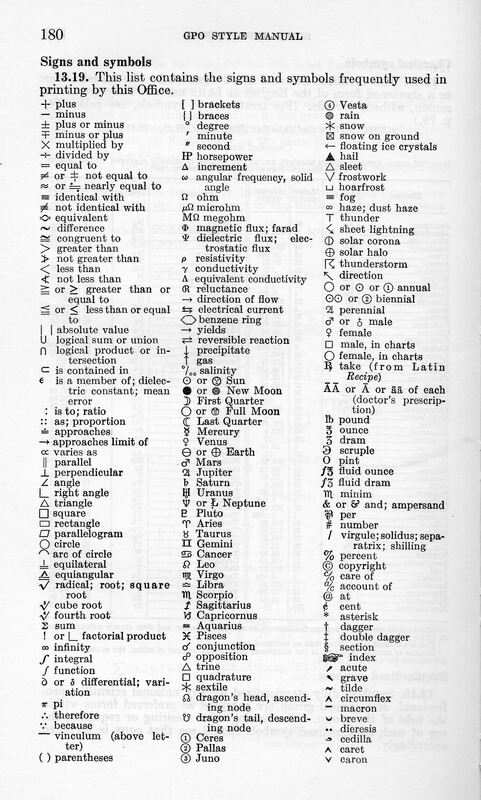 Nobody knows what the etymology of the term "caron" is, or where and when it was coined, but the earliest known use of the term is in the 1967 edition of the United States Government Printing Office Style Manual, from whence it was introduced into ISO character encoding standards (see Antedating the Caron for details). 034F COMBINING GRAPHEME JOINER This character does not combine graphemes, but rather indicates that adjacent characters should be treated as a graphemic unit. CYRILLIC SMALL LETTER OMEGA WITH TITLO The diacritic on these characters is not actually a "titlo" (although everyone agrees that it is not a titlo, it is not clear exactly what the origins of the diacritic mark is), which explains why they do not decompose to U+0460/U0461 CYRILLIC CAPITAL/SMALL LETTER OMEGA and U+0483 COMBINING CYRILLIC TITLO. The character is used to represent the exclamations "о!" and "оле! ", and is known in Russian as "beautiful omega" красивая омега or "wide omega" широкая омега. 0598 ֘ HEBREW ACCENT ZARQA This character is not actually a "zarqa" at all (which is U+05AE), but is intended to represent the sign called "tsinorit" that is used in the three poetic books (Job, Proverbs, Psalms), and that is centred above a base letter. 05AE ֮ HEBREW ACCENT ZINOR This character is intended to represent the sign called "zarqa" that is used in the twenty-one books of the Old Testament, as well to represent the sign called "tsinor" (sometimes transliterated "zinor") that is used in the three poetic books (Job, Proverbs, Psalms). Both these signs share the same glyph form and are placed above and to the left of a base letter. 0670 ٰ ARABIC LETTER SUPERSCRIPT ALEF This is actually a vowel sign, not a letter. 0B83 ஃ TAMIL SIGN VISARGA Although this sign derives from a special type of visarga, it is not called a visarga in Tamil, but is known as an "āytham" (which is a Tamilized form of the Sankrit word "āśrita", being a class of visarga). 0CDE ೞ KANNADA LETTER FA This letter has nothing to do with the sound /f/, but actually represents a Dravidian /l/, and should rightly have been called KANNADA LETTER LLLA, in line with the corresponding letters in other Indic scripts, such as U+0934 DEVANAGARI LETTER LLLA, U+0BB4 TAMIL LETTER LLLA and U+0D34 MALAYALAM LETTER LLLA]. LAO LETTER FO SUNG The character names for U+0E9D and U+0E9F are swapped. U+0E9D is a high tone class letter, and should have been named LAO LETTER FO SUNG (SUNG meaning "high"); whereas U+09EF is a low tone class letter, and should have been named LAO LETTER FO TAM (TAM meaning "low"). LAO LETTER LO LOOT The character names for U+0EA3 and U+0EA5 are swapped. LO LING is the mnemonic name for U+0EA5 ("lo as in ling [monkey]"); whereas LO LOOT is the badly transliterated mnemonic name for U+0EA3 ("lo as in "loot" for "ro as in rot [motor car]"). 0F0A ༊ TIBETAN MARK BKA- SHOG YIG MGO This character is meant to represent the sign that is used in formal documents in Bhutan to indicate an inferior addressing a superior (the "petition honorific"), but the Tibetan name BKA- SHOG YIG MGO actually indicates a superior addressing an inferior ("starting flourish for giving a command"). When the character that really indicates a superior addressing an inferior was later encoded at U+0F0D, it had to be assigned a slightly different but synonymous name, TIBETAN MARK BSKA- SHOG GI MGO RGYAN ("starting flourish for giving a command"). 0F0B ་ TIBETAN MARK INTERSYLLABIC TSHEG The tsheg mark is not restricted to intersyllabic usage, and may occur at the end of a terminal syllable or multiple times as "justifying tshegs" at the end of a line. 0F0C ༌ TIBETAN MARK DELIMITER TSHEG BSTAR This character is simply a non-breaking version of the "tsheg" mark (U+0F0B) that is used exclusively between the letter NGA (U+0F44) and the "shad" mark (U+0F0D). 0FD0 ࿐ TIBETAN MARK BSKA- SHOG GI MGO RGYAN Mistake for TIBETAN MARK BKA- SHOG GI MGO RGYAN (the syllable BSKA- does not naturally occur in Tibetan). 156F ᕯ CANADIAN SYLLABICS TTH This character looks like an asterisk, and it probably is an asterisk. The imaginary letter TTH was accidentally encoded when someone mistook an asterisk denoting a proper noun as a letter in the Canadian aboriginal script. <1881> ᢁ and <1881 180B> ᢁ᠋. When a decision was later made to unify the variant forms of the two characters and distinguish their variant forms by means of variation selectors, MONGOLIAN LETTER ALI GALI ANUSVARA TWO and MONGOLIAN LETTER ALI GALI VISARGA TWO were deleted, leaving MONGOLIAN LETTER ALI GALI ANUSVARA ONE and MONGOLIAN LETTER ALI GALI VISARGA ONE unchanged. 200B ​ ZERO WIDTH SPACE Being zero-width, it is not actually a "space". 2118 ℘ SCRIPT CAPITAL P Actually a lowercase calligraphic "p". 262B ☫ FARSI SYMBOL This is not a symbol of Farsi (the modern Persian language), but is in fact the official emblem of the goverment of the Islamic Republic of Iran. In Unicode 1.0 this character was properly named SYMBOL OF IRAN, but the name was changed on merger with ISO/IEC 10646. KATAKANA DIGRAPH KOTO These characters are ligatures, not digraphs. A015 ꀕ YI SYLLABLE WU This is neither a syllable nor pronounced "wu", but is actually a syllable iteration mark, similar in function to the ideographic iteration marks such as U+3005 々 IDEOGRAPHIC ITERATION MARK. CJK COMPATIBILITY IDEOGRAPH-FA29 These are all unified ideographs in their own right, not compatibility ideographs (which are duplicate ideographs encoded for roundtrip mapping to legacy character sets where the same character is encoded more than once, either as pronunciation variants or as minor glyph variants). FE18 ︘ PRESENTATION FORM FOR VERTICAL RIGHT WHITE LENTICULAR BRAKCET Mistake for PRESENTATION FORM FOR VERTICAL RIGHT WHITE LENTICULAR BRACKET. 1D0C5 탅 BYZANTINE MUSICAL SYMBOL FHTORA SKLIRON CHROMA VASIS Mistake for BYZANTINE MUSICAL SYMBOL FTHORA SKLIRON CHROMA VASIS. 1D13A 턺 MUSICAL SYMBOL MULTI REST The glyph is actually a "breve rest" or "double whole rest". A new character named MUSICAL SYMBOL MULTIPLE MEASURE REST is introduced in Unicode 5.1 at U+1D129 to represent a rest of arbitrary length (sometimes called an H-bar rest). DIGRAM FOR EARTH TaiXuan Jing symbols are made up of a combination of three different elements, an unbroken line that represents heaven (Chinese tian 天), a single broken line that represents earth (Chinese di 地) and a double broken line that represents human (Chinese ren 人). The monograms and digrams are named using the terms HEAVEN, EARTH and HUMAN, but they map the single broken line to HUMAN and the double broken line to EARTH, which is not the normal association. Note 1. The 65 control characters at <0000..001F>, <007F> and <0080..009F> do not have have formal names in Unicode or ISO/IEC 10646, and they are generally referred to by their designations in ISO/IEC 6429. However, there is a move under foot to formally define names for these characters (see N3046 "Improving formal definition for control characters"). Unicode has now issued their own list of anomalous character names as Unicode Technical Note 27 : Known Anomalies in Unicode Character Names. 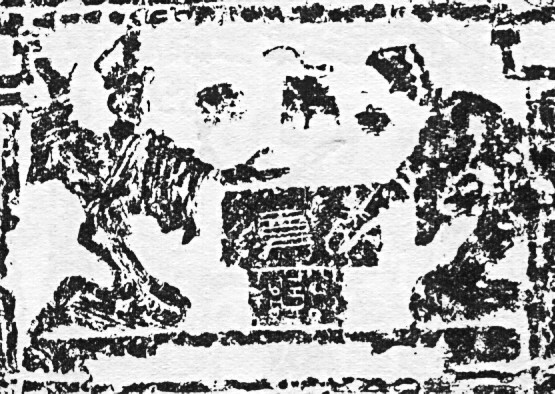 In the 1990s this fragment of a crude pottery board was excavated from the site of the southern gate to the mausoleum of Emperor Jing Di 景帝 (reigned 156-141) and his consort at Yangling 陽陵 near Xianyang in Shaanxi province. 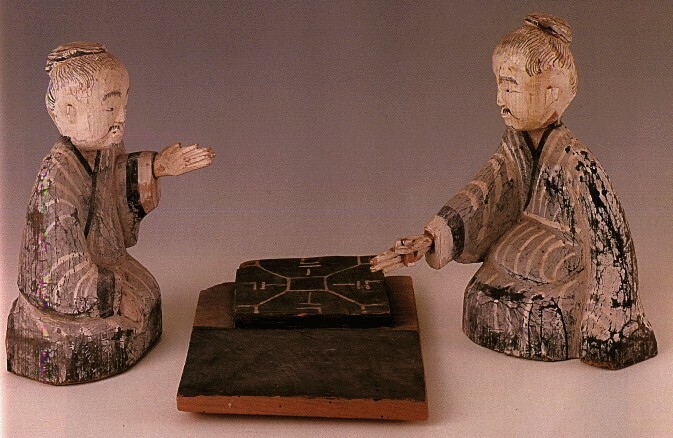 Although the board is not associated with the main burial, it must date to the Western Han period (206-25), and so is the earliest physical evidence of the game of Go. 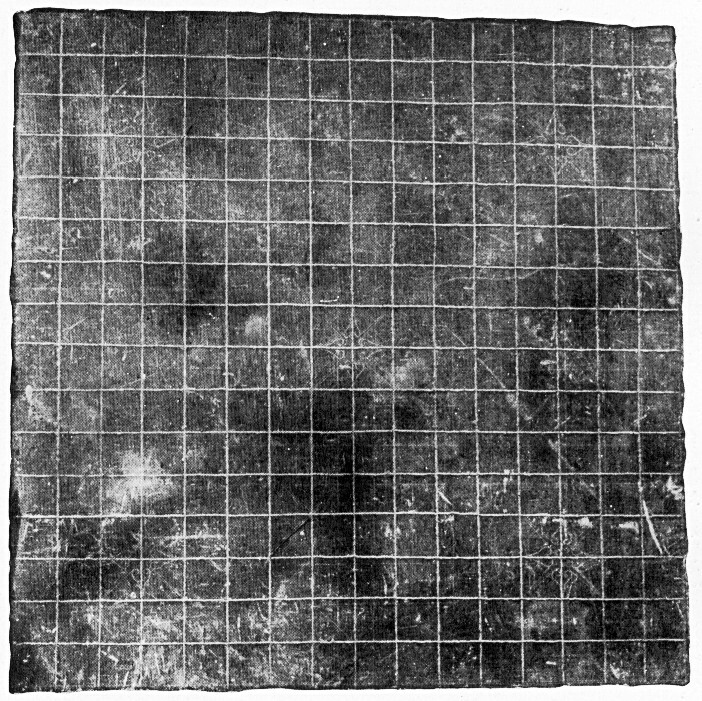 Unfortunately it is not possible to tell whether this was a 17 × 17 board or 19 × 19 board (it has one star point marked at the lower left corner, but no star points on the sides or in the centre). 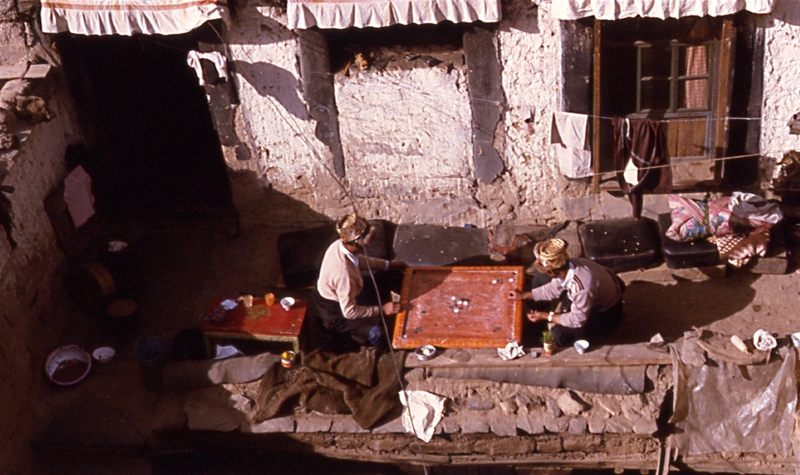 The correspondence between Tibetan Go boards and early Chinese Go boards has led some game historians to conclude that Go originated in Tibet, and then spread to China, where the board later developed to a 19 × 19 grid. However, there is a much longer documented history of Go playing in China than there is in Tibet, and it seems more likely to me that Go originated in China, and spread to Tibet at a time when the 17 × 17 board was still in use; then due to the isolation of Tibet, Tibetan Go preserved the archaic 17 × 17 board when it was superceded by the 19 × 19 board in China and elsewhere. Confucius said : "If you eat your full all day long, and have nothing to apply your mind to, that is disastrous ! Are there not games of chance and skill ? Would it not be better to play such games than do nothing ?" Lun Yu 論語 "The Analects of Confucius" (Zhonghua Shuju, 1980) 17.22. 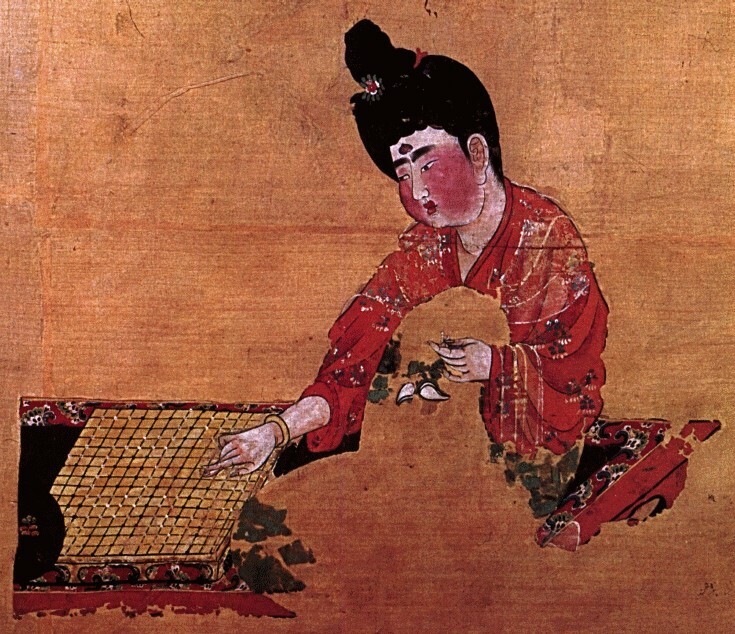 Nevertheless, I am still dubious as to whether early references to yì 弈 do actually refer to the game of Go because there is a complete absence of any supporting archaelogical evidence prior to the Han dynasty. This would not be significant in itself were it not for the fact that the game of Liubo is abundantly attested in the archaeological record. 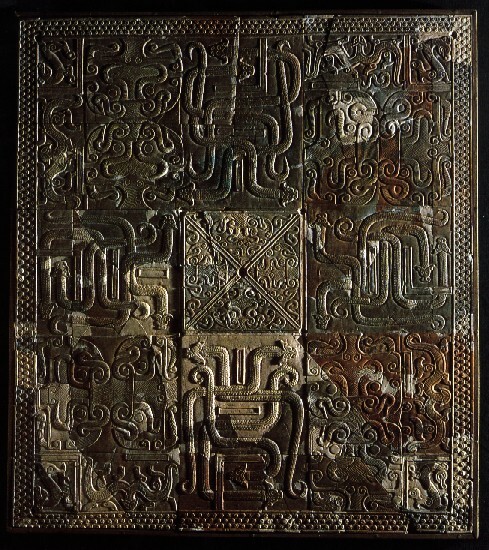 Not only have dozens of Liubo boards been unearthed from Han and pre-Han tombs, but scores of Han and pre-Han murals and engravings showing people playing Liubo have been found, as well as statuettes of Liubo players. Source: Mysteries of Ancient China (British Museum, 1996) page 76. 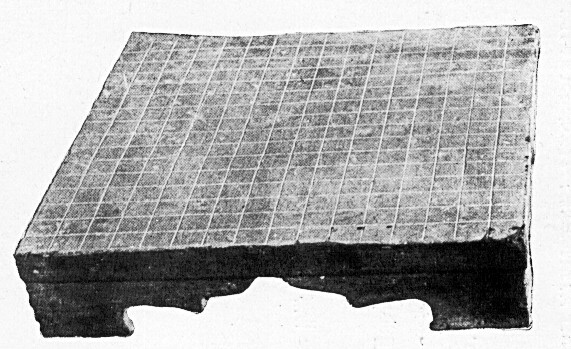 Note that the Liubo board is usually depicted to the side of the mat where the six sticks are laid out. Note the typical posture of the left player, with one arm raised in readiness and the other arm stretched out towards the six sticks. 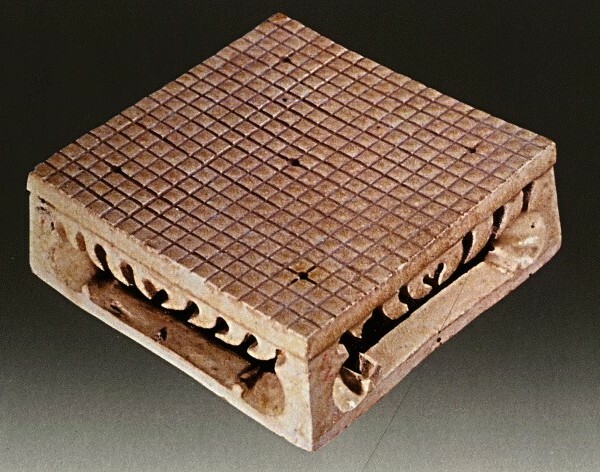 In stark contrast to the wealth of early material for Liubo, only two Han dynasty Go boards are known, and the earliest certain image of Go-playing does not occur until post-Han. 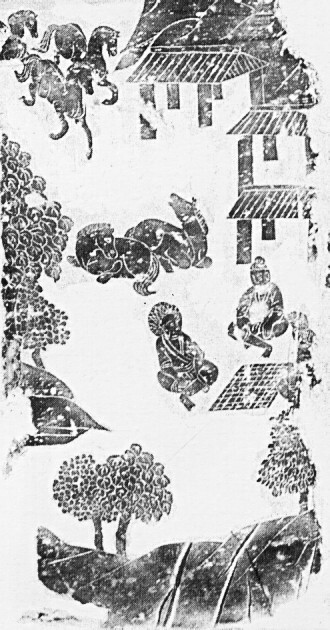 The picture below is the left side panel of an illustrated stone monument depicting the life of Buddha that dates to the Northern Qi (550-577). 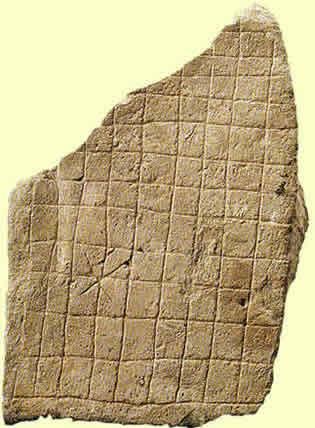 The board shown is probably a Go board, although it only has an 11 × 11 grid, but this might be simply because there was not enough room to engrave more lines. To my mind, this suggests that Go may not have been invented until the Han dynasty. At any rate, once Go became popular it quickly supplanted Liubo. There is virtually no evidence of Liubo being played post-Han, and it seems to have become extinct within a few generations of the rise to prominence of Go. The precise rules of Liubo are now long since lost. The Go board has seventeen vertical and seventeen horizontal lines, making two hundred and eighty-nine points; the black and white stones are each one hundred and fifty in number. Shuo Fu Sanzhong 說郛三種 (Shanghai Guji Chubanshe, 1988) p.4693. Non-standard boards (e.g. 13 × 13) continued to be used in addition to the standard 19 × 19 board for many more centuries, as I discuss in my post on Playing Go on a Chinese Chess Board.